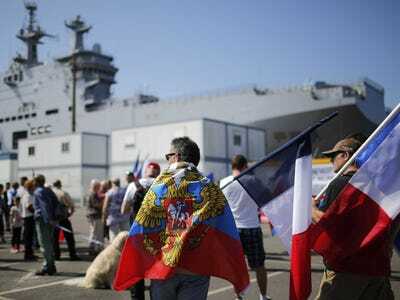 REUTERS/Stephane MahePeople hold Russian flags, French flags and placards in front of the Mistral-class ship, the Vladivostok. Russian sailors were denied access to the Mistal helicopter carrier in Saint-Nazaire shipyard on Monday, according to reports in the French media. There are currently 550 Russian sailors based in the shipyard, 400 of whom are set to be the Vladivostok’s crew providing the ship is eventually handed over. The sailors were reportedly prevented from entering the ship by French authorities, the French regional newspaper Ouest France reported, although they regained access on Tuesday. France missed its November 14 deadline to hand over the Vladivostok to Russia, with France’s prime minister Manuel Valls stating last week that the “conditions to deliver the Mistral are not there”. There has been growing confusion surrounding France’s position, however. President Hollande has consistently stressed that they have the right, though not the obligation, to sell the warships under terms agreed during negotiations over sanctions against Russia for its role in the Ukraine crisis. Yet his conditions for the sale — a permanent ceasefire and roadmap for a permanent settlement for both sides of the Ukraine conflict — look as distant a prospect as ever. Chairman of the Duma Committee on International Affairs Alexei Pushkov said on Wednesday that France’s actions over the sale show that they are no longer able to act as an “independent state”. Russia has given the French company responsible for delivering the Vladivostok a deadline of end of the month to hand over the ship or else it will launch a claim for breach of contract.